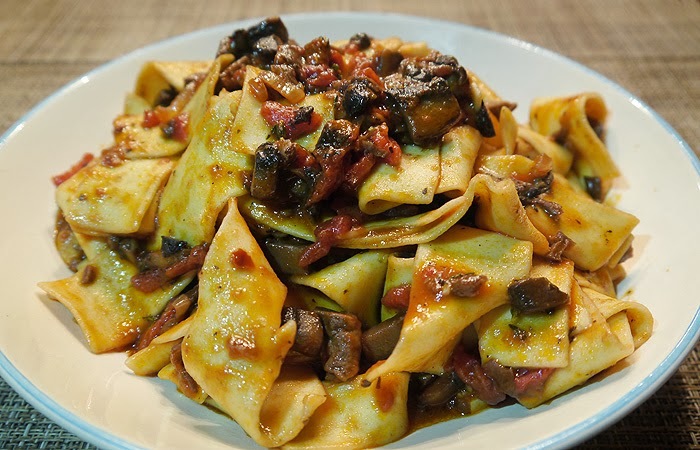 This is a rich and hearty dish that derives its great flavor from the porcini mushroom. Native to the Alpine region of Italy and France porcinis have a very distinct aroma and taste. They are readily available dried and are easily re-hydrated by soaking them in water. Though the soaking liquid is often discarded; I will often save it flavor my stocks. Porcinis make this pasta dish rich & tasty; so much so you will easily forget it's a meatless meal. Aside from soaking the mushrooms, the pasta comes together rather quickly yet appears like you spent hours in the kitchen cooking. In a 12 to 14-inch saute pan, heat the olive oil over high heat until smoking. Add the onions and cook over high heat for 5 minutes, until onions are light golden brown. Add the mushroom pieces and continue cooking until they have given up most of their water, about 9 to10 more minutes. Add the wine and the tomato sauce, butter and salt and pepper to taste and reduce heat to medium. Cook for 5 more minutes, until mixture is of a ragu consistency. Meanwhile, cook the pasta in the boiling water according to package directions. Drain the pasta, reserving the cooking water, and add the pasta to the ragu. Toss over high heat one minute to coat the pasta. Divide the pasta evenly among four warmed pasta bowls, grate Parmigiano over and serve immediately. that looks really good. we made a mushroom ragu recently and in spite of the glut of cremini, it didn't have enough mushroom flavor. I think the porcini are the key. By the way, is that fresh or dried pappardelle in the shot? This looks awesome! I love the thick noodles and different types of mushrooms....would love to try this! Thanks so much for sharing at SNF!